This picture pretty much describes how we spent our vacation but everything does indeed have an end. No sense taking the most direct route back. We came up with a unique way to leave Nova Scotia and hit New Brunswick enroute to Maine. This was all (mostly) thanks to a book we read. Have you ever read Anne of Green Gables? 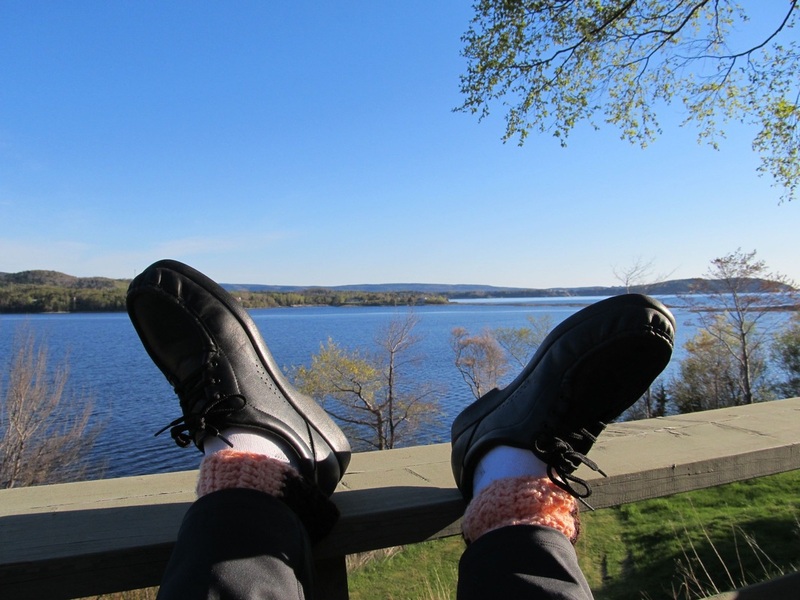 It is the story of an orphan girl who lives on Prince Edward Island. She was adopted by a brother and sister who had a farm outside a fictional town named Avonlea. They wanted a boy but someone filled the order wrong. It turned into a series and they became classics. Neither Sally nor I had heard of them but a friend told us we had to read the original before we went to Nova Scotia. We are glad we did but we would have liked it anyway. We read them while we traveled and they were all based in Avonlea. Anne Shirley, we didn’t see you but we sure did see a batch of your native land. 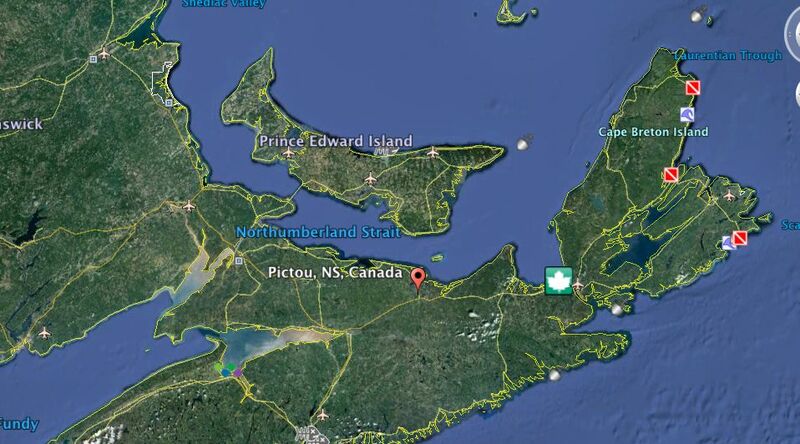 Prince Edward Island (PEI) is not part of Nova Scotia or New Brunswick. It is a province all by itself. When one considers the vastness of the prairie provinces that is amazing to me. Sort of a Rhode Island vs. Alaska or Texas scenario. There is a Ferry and a bridge (called the link) connecting the island to the mainland. You can see both routes in this picture. We were told that the bridge is the longest one to go over ice. No ice while we were there but it was still pretty long. They do not charge to go over to the island but they do charge to get off. The ferry is much more expensive than the bridge which is over $40. You see where this is going, don’t you. We rode the ferry over from Pictou and drove out. The town of Pictou is sometimes referred to as the birthplace of New Scotland (Nova Scotia). I believe it was our hostess at Ingonish who said the first settlers found the only place with a winter as bad as Scotland. If you would like to see some history of this Scottish settlement go here or Wikipedia. http://www.novascotia.com/en/home/ourregions/ourregions/northumberlandshore/pictou.aspx My mom was named McClure and talked a lot about being scotch. I tried to absorb some of the culture before we got underway. We met Leon and Lois on the Ferry. Sally has never met a stranger and come to find out, neither had they. 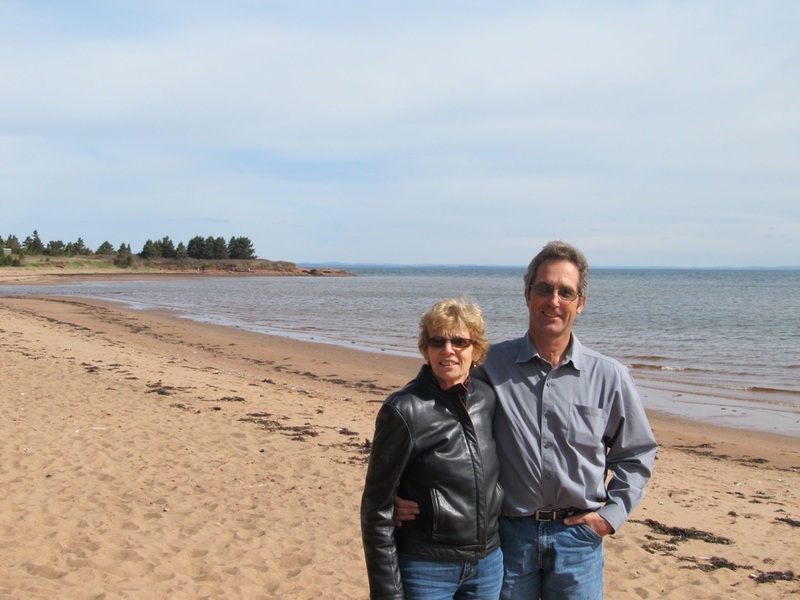 They helped us get our bearings on Prince Edward Island and took us to a beach where they had beautiful sand. We took some of that PEI sand to our grandkids as souvenirs. Thanks for your kindness. Hope you are reading this and enjoying your summer. PEI is beautiful and I’m not going to go on and on about it. I think the local folks might not like to see it described as quaint but it is. Every place looks like it was just painted or just scrubbed. I want to go back but in the summer. PEI is all over the slideshow and I will caption where needed. Hope you enjoy.